A themed Christmas tree can be a stunning centerpiece for your holiday decorations, but how can you design a theme that will be beautiful and elegant without looking cliché or overdone? There are many amazing themes you can choose for a Christmas tree, but above all, the theme should be fun, significant and meaningful to you and your family. You might choose a theme that represents your year, such as a new home, new baby, world travel or commemorating similar memorable events. Favorite sports teams, television shows, movies and books are also popular themes. Your theme could be tied to pets or represent geography you love, such as a beach-themed Christmas tree. Hobbies and careers are other options, or you might design a patriotic tree or one in favorite colors rather than a more specific theme. Ultimately, the choice is yours and you should choose a theme you will enjoy. No matter what theme you choose for your Christmas tree, there are certain traits that all well-designed, beautifully themed Christmas trees have in common. If you want a themed tree, you need to choose just one theme to guide your decorating. For example, if you have several hobbies – such as sewing, reading and gardening – it is best to choose just one for a theme so the tree will be coordinated rather than a jumble of widely varied tastes that may not blend well together. Similarly, your theme should be specific enough to present a uniform look. A beach theme, for example, could focus on seashells, dolphins, sea turtles, whales, sharks, tropical fish, mermaids, anchors, boats or palm trees, but including every type of beach decoration possible would be overwhelming. It can be easy to go overboard with a themed Christmas tree. If every inch of every branch is crowded with lights, ornaments, garland, tinsel, ribbons and other paraphernalia, the elegance of the design will be lost and the tree can look trashy. Instead, select decorations carefully to enhance the theme, and be sure they are arranged so that they can be easily seen and appreciated. While you might be able to find all sorts of decorations that coordinate with your chosen theme, it isn't necessary to use every possible decoration on your tree. To really draw your theme together, consider decorations from the tree's topper to the tree skirt or stand. If every bit of the tree subtly coordinates with the theme and colors, the overall effect will be stronger and will show your thoughtfulness and design flair. You might even consider opting for matching or themed gift wrap for presents that will be placed under the tree so the entire effect is outstanding. Instead of overdoing your tree with kitschy ornaments, patterned ribbons, die-cut garlands or shaped lights, choose colors that match your theme but can be used in simpler ways. A tree themed for your favorite sports team, for example, does not need every ornament shaped like sporting equipment or showing an official logo. Instead, use plain round ornaments in the team's colors for a more sophisticated but equally festive look. Lights in single colors, plain garlands and other simple but coordinating details can keep your tree elegant while still supporting the overall theme. There will be certain decorations that are stand out pieces, and these should be placed at eye level at the front of your tree where they can be seen and appreciated more easily. These special ornaments help promote your theme and should not be hidden behind garlands, ribbons or plain decorations, nor should they be tucked deeper into the tree where they may be concealed by branches or needles. Take care that any logos or details are facing outward so they are clearly visible. Unique details will make your theme truly stand out, and you shouldn't be nervous about unusual options that coordinate well with your overall vision. For example, a tree's topper can be much more than a star, angel or Santa figure. Why not a baseball cap or helmet for a sports-themed tree, or antlers for a hunter's tree? A starfish is a fun twist to top a beach-themed tree, a sorting hat or wizard's cap is fun for a Harry Potter tree or a Captain America shield can be the crowning glory on a comic book or superhero tree. Likewise, a tree's skirt can also be easily coordinated with the theme for a fun base to the anchor a Christmas tree theme. Above all, decorate your tree carefully no matter what theme you choose or how you coordinate its decorations. 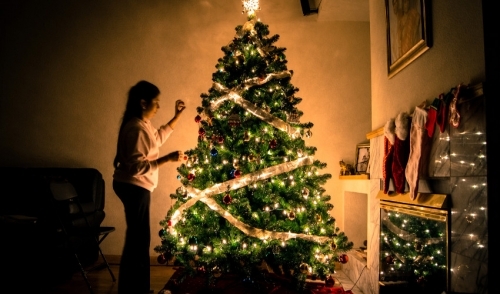 Be sure lights are evenly distributed so there are no dark spots on the tree, and ornaments should be placed with a keen eye toward size, color and spacing so the tree is properly balanced and well-proportioned. This thoughtfulness will give your tree an overall polish that will make your theme truly shine. A Christmas tree theme can be a fun way to coordinate your holiday decorations, and when you plan and execute your theme well, it will make for a stunning tree you enjoy throughout the season.